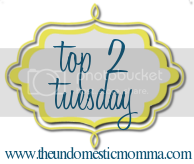 Today I'm linking up The Undomestic Momma and her Top 2 Tuesday! It's not too late for you to link up!! stopping by from TOP TWO TUESDAY!